Nepal has many remarkable religious places, which reflect the long history of Nepali art and architecture. Below, we describe some of the famous religious places of Nepal. The Balmaki Ashram is situated in the forest on the banks of the Terbeni river, at the southwestern corner of the Royal Chitwan National park. It was a retreat used by the great Hindu sage, Balmaki. This is where Sita is sad to have live with her two sons, Labha and Kusha, after separation from Rama. Various statues were unearthed in this area during an archeological excavation in the late 60's. Recently, a Temple of Sita has been built here. Devghat is situated 6 km to the north of Narayanghat, the gateway to the Royal Chitwan National Park. On the day of the Makar Sakranti festival in January pilgrims come here to take holy dips in the Narayani, formed by the meeting of the kali Gandaki and Trisuli. There is a settlement of a community of elderly, retired people here. Davghat can be reached by taking a daily flight or bus services. Dhanushadham, a historical and religious site, dates back to the time of the great epic- Ramayana. It is located 18 km northeast of janakpur in the south central region of Nepal. Dhanushadham was the place where Lord Rama had broke Shiva's divine bow, a condition for winning the hand of Sita in marriage. According to the epic, one of the three pieces of the bow fell in the present day Dhanushadham. Muktinath of religious importance to both Hindus and Buddhists. The main shrine of Muktinath is a pagoda-shaped temple dedicated to the Lord Vishnu. In the walls around it are 108 waterspouts. The Jwala Mai temple nearby has a spring and an eternal flame fed by natural gas. Muktinath is set in the north central part of Nepal. 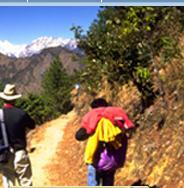 It is a six- hour walks from the jomsom airport. Helicopters are also available. Ridi is among the most popular religious places in Nepal. Rikeshwor narayan Mandir, situated here, is the local version of the Pashupatinath temple with its auspicious Ghats (cremation grounds). It is situated at the confluence of the Kali Gandaki and the Ridi Khola, linked by a 50 km dirt road to the hill resort town of Tansen. During the Makar Sankranti Festival, hundreds of devotees from different parts of the world throng the Dhanusha temple to worship the fossilized bow fragments and to take ritual dips in the river. Here, thee are other temples dedicated to Devendra and Ganesh too. A lake is believed to have been created by Lord Shiva when he thrust his Trisula (trident) into a mountain to extract water so that he could cool his stinging throat of the lake, which is said to be the remains of a Shiva shrine. People often claim that they see Shiva lying in the water. Devotees gather here in hordes on the full moon night of August to take holy dips in the lake. Gosaikunda is situated at the altitude of 4380 m t. to the north of Kathmandu on the Lang tang trekking trail. The holy lake is a two daylong trek from Dhunche, which can be reached through an adventurous 118 km mountain road from Kathmandu via Trisuli Bazaar. Small hotels and pilgrim shelters are available here for travelers. The Temple of manakamana, a very popular pilgrimage in Nepal, is a temple of one of the manifestations of the Hindu goddess Bhagawati. Bhagawati is belived to have the power to fulfill wishes. It lies 125 km to the west of kathmandu. It is a steep three- hour hile from Abu Khairenion the Kathmandu-Gorkha highway. A cable car also takes travelers to manakamana. The capital of the former kingdom of Tirahut, is the seat of a rich civilization, which peaked between the 11th and 14th centuries. The ancient city suffered terrible devastation in the hands of invaders but its cultural glory remained in the archeological treasures that are found here. They’re many Hindu temples that draw people to this place in large numbers. Simraunghadh is situated in the Terai plains to the south of Kathmandu. The most convenient access to this place, by air, is from Birgunj (270 Km away from Kathmandu). Another route to Simraugadh is a Flight to Simara (15 minutes) and then a drive to Birgunj (25 km) from where it is 45 km to simraughad. Most of the festivals celebrated in Nepal are religious. However, they can be generally divided into four sections keeping in mind the main aspects of the festival emphasized.